This year, I decided to shake things up and spend my birthday in New York City. If I HAD to get older (and try as I might, there seemed no realistic way to avoid it) I may as well do it in style with great friends and good food. And thus began the week I ate my weight in New York's *best* mac and cheese. Stepping out of the sliding glass doors at JFK airport, I immediately got into a fight with a pushy gypsy cab driver (as if there is any other kind.) I heart New York but I never use the words "rip off" or think about getting "ripped off" unless I'm in the city that never sleeps. I resent the shifty way drivers descend upon unsuspecting disoriented travelers and try to suggest only numbskulls stand in line for a cab. Say what you will about Los Angeles but you'll never be assaulted by a mob of aggressive brutes trying to corral you away from the taxi stand into a dirty town car. I tried to shake off the agitation from the taxi altercation as I headed to Brooklyn to visit my dear friends Terence and Martine. As soon as I set eyes on my friends and the delicious home cooked meal they prepared for my arrival, all my cares melted away. 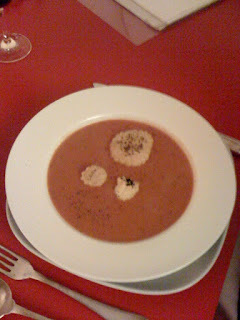 A steaming bowl of home made tomato bisque soup with crackers and delicious puffy cheese toasts warmed my empty gullet and heart. The next day, I headed into Manhattan to attend a two day writer's conference at the Grand Hyatt Hotel. After the first day of sessions ended, I hopped in a cab to visit another dear friend, Dana, near Lincoln Center. Without much prompting, my cab driver launched into a sad tale about his unmarried daughter, her deadbeat baby daddy, his own near death heart attack and finally wondered if I thought the baby daddy would ever get a job with a prison record. By the time I arrived at Dana’s pad, I was in desperate need of a pick me up (and yes I tipped him very generously. But in the back of my mind I thought, is he making this up to get a big tip?) With temperatures as low as 15 degrees, it was perfect mac and cheese weather and just what the analyst ordered. Dana lives above a Gourmet Garage or "New York's favorite neighborhood market place," as it is coined on the official website. GG is kind of like a mini Whole Foods stocking a nice selection of organic and non organic produce, fish, meat, fresh pasta, baked goods, coffee etc. It's not quite as high falutin' as Whole Foods but the prices are pretty much on par. What do you expect? It is New York after all. Popping down for a quick bite, I made a bee line for the deli cases. There were two pans of mac behind the glass; One pan was 3/4s empty, a sad gummy mess having seen better days. The other had just emerged from the oven, a thick crispy cheese layer blanketing the top. I requested a scoop from the unadulterated pan and the server said in typical NY impatient fashion, "They're exactly the same!" Beyond the obvious differences, I could see the fresh pan was made with ziti noodles and the near empty pan, elbow pasta. Holding back my desire to yell, Hey! Do I look like I was born yesterday? Don't try to rip me off!, I politely pointed out the noodle difference to the server. He scooped out a portion and acquiesced with a sheepish smile, "You're right. I thought they were the same but they are different." Believe it or not, this was one of my favorite mac and cheese preparations from the trip. 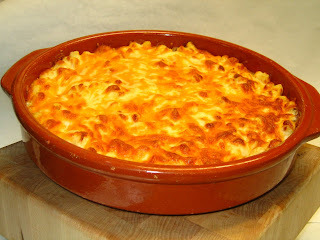 Similar in taste to the New York Times recipe, it was comfort food at its best. A straight forward preparation made with mostly cheddar cheese and either ricotta or cottage cheese, it had that kind of lasagna like consistency. There may have been another mild white cheese in the mix, a Monterey Jack perhaps. Sadly, nary a crumb dusted the top but the thick cheese crust acted as a stand in, providing texture and crunch over the cheesy casserole lying beneath the surface. Homey and hearty but not too rich, the noodles were firm, a miraculous feat for steam tray fare. It was seasoned with just the right amount of salt and my friend Dana and I wiped the container clean in ten minutes flat. If I lived above that Gourmet Garage it would be very dangerous indeed. After this delicious foray into New York's mac offerings, I believed it was a sign of great mac to come. The results were unexpected.